Gamaliel the Elder, or Gamaliel I, was the leading Jewish teacher of his day in the first half of the first century C.E. He was the grandson of the great rabbi Hillel the Elder and a high authority in the Sanhedrin in the mid-first century. His son Shimon ben Gamaliel was one of the leaders of the Jewish rebellion against Rome, and his grandson, Gamaliel II, was an even more famous Sanhedrin leader than Gamaliel I himself. Gamaliel I died around 54 C.E. One of his most famous sayings is "Secure a teacher for thyself." Gamaliel is known to the Christian world as the Pharisaic leader who saved the disciples from death in a story in the Book of Acts, in which he is quoted as saying, "If their purpose or activity is of human origin, it will fail. But if it is from God, you will not be able to stop these men." He is the only leader of the first century to be greatly honored in both the Jewish and the Christian traditions. Even though few of his actual teachings have been preserved, Gamaliel I held a reputation as one of the greatest teachers in the annals of Judaism. The Mishnah (Sotah 9:15) pays tribute to this quality, saying: "Since Rabban Gamaliel the Elder died, there has been no more reverence for the Torah, and purity and abstinence died out at the same time." While believing the Law of Moses to be wholly inspired by God, he took a broad-minded and compassionate attitude toward its interpretation, much like his famous grandfather, Hillel the Elder. Gamaliel ruled that the sabbath laws should be interpreted realistically rather than rigorously. He also argued that the law should protect women during divorce and urged Jews to be kind toward Gentiles. A tradition preserved in the New Testament shows that he also took a liberal attitude toward controversial groups within Judaism as well, including the messianic movement centered on Jesus of Nazareth. The Book of Acts relates that he intervened on behalf of Saint Peter and other Jewish followers of Jesus, telling his Sanhedrin colleagues: "Leave these men alone! Let them go! For if their purpose or activity is of human origin, it will fail. But if it is from God, you will not be able to stop these men; you will only find yourselves fighting against God" (Acts 5:38-39). In the Talmud, Gamaliel bears the title "Rabban," a title given to the nasi, or head of the Sanhedrin. A leading member of the House of Hillel, the liberal branch of Pharisaic Judaism founded by his grandfather, he was the first of seven known members of that school who reportedly earned the title of nasi. In the Mishnah, Gamaliel is spoken of as the author of several legal ordinances affecting the welfare of the community and regulating issues concerning conjugal rights. 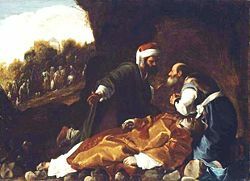 Among his rulings, Gamaliel decided that for the purposes of remarriage, a single witness could provide sufficient evidence of the death of a husband (Yevamot 16:7). 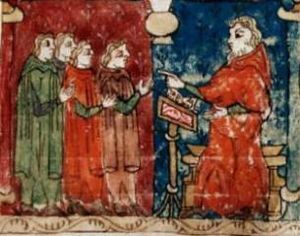 Gamaliel appears as the ruler of the Sanhedrin in three surviving epistles which he dictated to the secretary Johanan (Sanh. ii.6; Sanh. 11b; Yer. Sanh. 18d; etc.). Two of these letters went to the inhabitants of Galilee and southern Palestine dealing with the question of tithes. The third letter was written to the Jews of the Diaspora and gave notice of important changes in the official Jewish calendar. Gamaliel figures in two anecdotes as the religious adviser of King Agrippa I and his wife Cypris (Pesahim 88:ii). Despite his renown, relatively few of his teachings have been preserved, in part because his opponents in the House of Shammai seem to have gained or retained control of the Sanhedrin after his death. Bitter disputes ensued between the followers and Hillel and Shammai and it is possible written memories of Gamaliel's work were suppressed. In one teaching, preserved somewhat imperfectly, Gamaliel compares types of his students to varieties of Palestinian fish (Aboth di R. Nathan, cb. xl.). In this arrangement Gamaliel enumerates the following kinds of pupils: 1) a diligent student who has no understanding; 2) a good student who also possesses understanding; 3) a pupil who has learned everything but does not know how to reply; and 4) a pupil who has learned everything and knows also how to reply. These correspond to the following varieties of fish: 1) an unclean (ritually inedible) fish; 2) a clean fish; 3) a fish from the Jordan; 4) a fish from the great ocean (the Mediterranean). One of his best known sayings was, "Secure a teacher for thyself." (Abot i. 5) Another was, "Hold thyself [in religious questions] far from doubt, and do not often give a tithe according to general valuation." It is thought by some scholars that many sayings of Gamaliel I were erroneously ascribed to his famous grandson of the same name, Gamaliel II. In Acts of the Apostles Gamaliel is described as a Pharisee and celebrated scholar of the Mosaic Law. He appears in an episode in which the disciples have been arrested by the high priest and other members of the Sadduceean party for publicly accusing them of unjustly putting Jesus to death. In Acts (5:34 ff. ), citing past revolts based on the prophesied Messiah, such as Theudas and Judas of Galilee, Gamaliel advises his fellow members of the Sanhedrin not to execute Saint Peter and the Apostles despite their insistence on publicly preaching the Gospel. His advice was acted upon, so great was his authority with his contemporaries. It is also stated that Gamaliel was the teacher of Saint Paul. In Acts 22:3 Paul tells a crowd in Jerusalem, "I am a Jew, born in Tarsus in Cilicia, but brought up in this city, educated at the feet of Gamaliel according to the strict manner of the law of our fathers, being zealous for God as all of you are this day" (Acts 22:3). But we are told nothing about the nature or the extent of the influence which he exercised upon the future apostle of the Gentiles. Because of his sympathetic attitude to the early Christians, at an early date Christian ecclesiastical tradition has supposed that Gamaliel I embraced the Christian faith, and remained a member of the Sanhedrin for the purpose of secretly helping his fellow-Christians. According to Saint Photius, he was baptized by Saint Peter and Saint John, together with his son and Nicodemus. His body was said to be preserved at Pisa, in Italy. Contemporary Jewish records, however, continue to list him and his sons as respected leaders in the non-Christian branch of the Jewish community. This would be highly unlikely if he had been a convert to Christianity. ↑ Some dispute exists as to whether Gamaliel actually served as president of the Sanhedrin. However, his influence and reputation as a leading member of that body is beyond question. ↑ Gamaliel I. Jewish Encyclopedia. Retrieved May 16, 2007. This page was last modified on 19 May 2017, at 16:21.